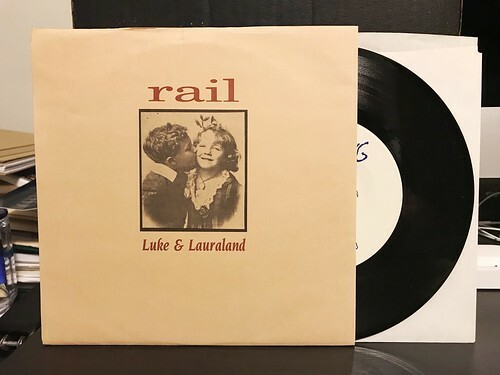 I Buy Way Too Many Records Dot Com: Rail - Luke & Lauraland 7"
Rail is one of those bands that has been existing in the background of my life for decades. Every five years or so I stumble across another one of their records, spend some time trying to figure out if it's the correct Rail and then adding it to the collection. This 7" was bought as part of a larger lot of older records I picked up on Discogs. I think it was a dollar and that was a dollar well spent. Things start off with the more melodic and, frankly, emo leaning "Reconsider." It's a mellower start to the EP and kind of stands apart from the other three. By the time we get to "Cheerleader on Prozak," you can start to see the bouncy, Superchunk style energy that Rail possess. They have a knack for taking a truly rough and fuzzy recording and making it work to their favor. It sounds like a time capsule of the mid 90's, when it seemed like every band that picked up a guitar had a hit up their sleeve. On the B side, we have probably the highlight of the 7", "Tickin." This is just a blast of hooks, catchy singalongs and buzzsaw chord progressions. Just a great song. Finally we close out with the title track "Luke & Lauraland." This one may be the most Superchunkian of all, with its lower key verse and giant anthemic chorus. This is one of the better Rail 7"s I've picked up. I think I only need one more of them at this point, but who knows. I always seem to stumble across these guys when I least expect it.